I’m here, really. I’ve been in a bit of a funk the last few days with a lot going on including a sick cat, sick family member, work, and other stresses. Miko was so sweet when I got home from work today ready to play and following me around the house. 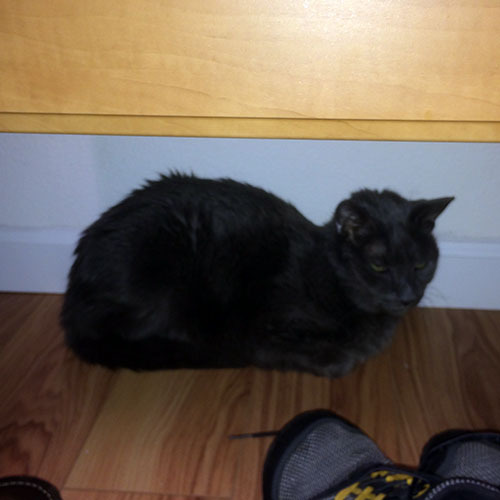 Shadow is hanging in there, he’s been sleeping in our closet most of the day lately. And still not happy about taking 3 pills a day. I’m still getting my technique down for giving them to him, I didn’t need a band-aid today – progress! 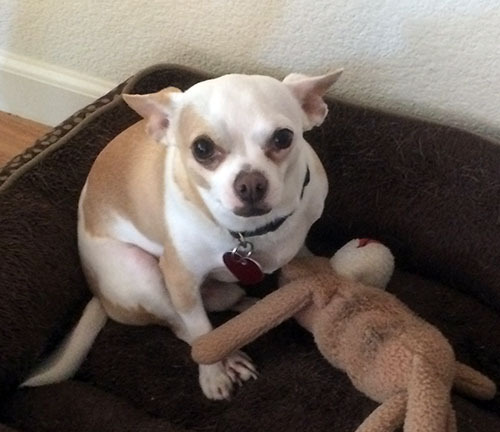 And I’m hoping for good news at his follow up vet appointment this week. I have been enjoying some great eats the last couple of weeks as we try new restaurants in the area. 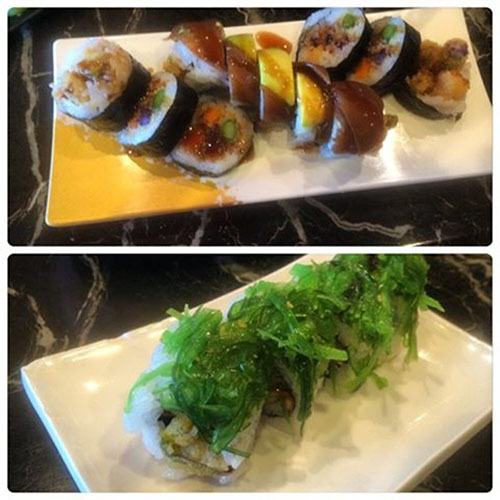 We found a great selection of veggie sushi rolls at Raku Sushi, probably the best selection I’ve seen. It’s a sushi buffet, but you order rolls off a menu which are made fresh and they’re more like half rolls, perfect size for sampling a few different kinds. The buffet menus do not have a lot of vegan options, but the take out menu does which they let me order from when I explained I was a vegan. The most interesting roll was the dragon roll in the top because it was wrapped in marinated thinly sliced zucchini that looked like fish. A little freaky at first. 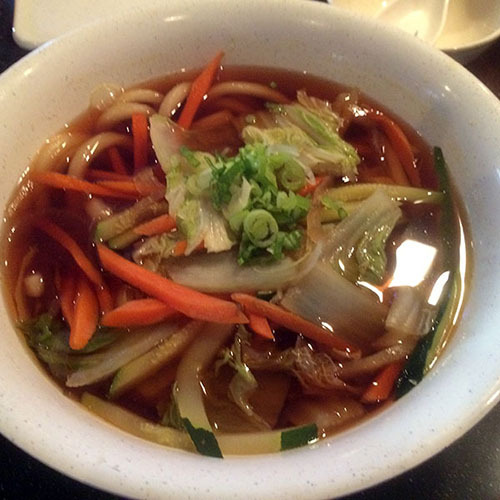 We also hit Crazy Sushi where I had a huge bowl of vegetable udon soup. Savory and the noodles were hugely filling. 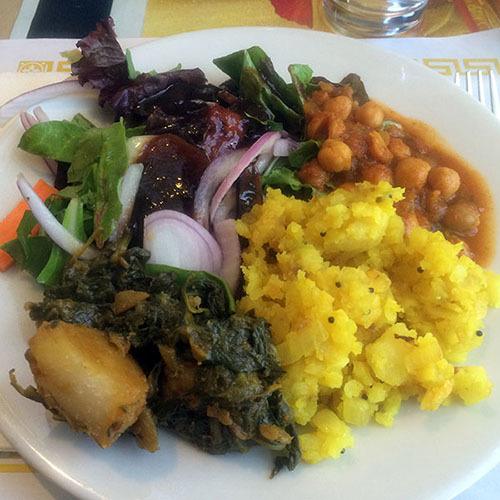 And we checked out the lunch buffet at Taj Oven where it was easy creating a filling vegan plate. Salad, spiced potatoes, a potato and spinach dish, and chana masala. 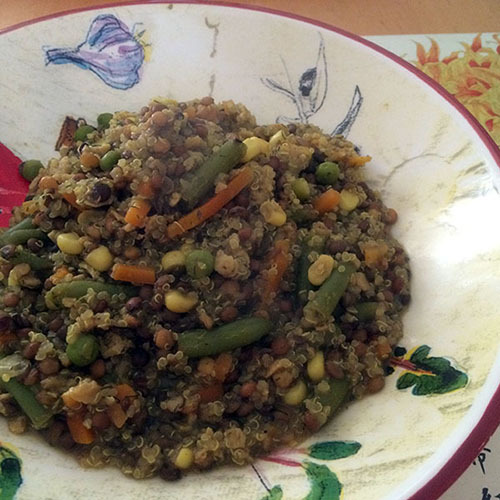 I created an interesting lentil curry dish by simmering lentils, the last bit of quinoa, a frozen veggie mixture, and textured vegetable protein to use up odd leftovers in the freezer and pantry. I played mad scientist adding curry powder, dill, oregano, pepper, and other seasonings until it worked and it was very tasty and filling. 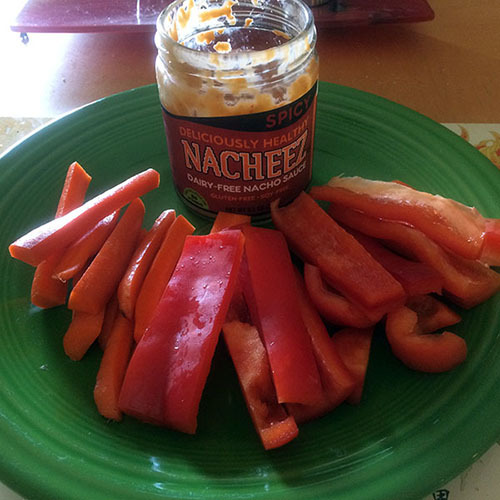 I also had an interesting lunch over the weekend using up a jar of Nacheez with fresh veggies. 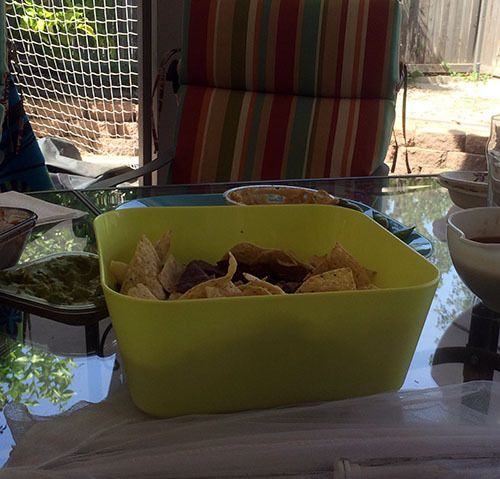 For Father’s Day, we had a casual family gathering at my sisters where there was not a lot of vegan options for the main meal, but I stuffed plenty on tortilla chips and veggies dipped in guacamole and hummus. 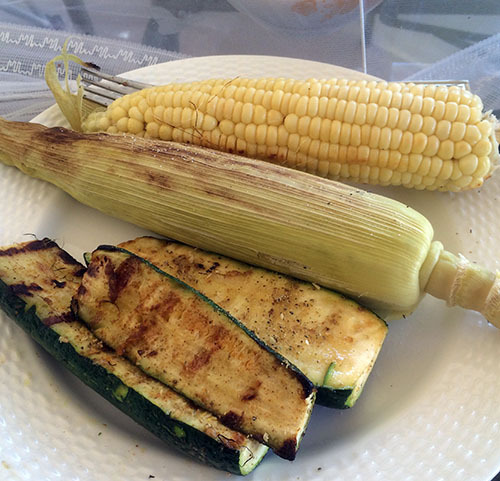 And my main course was grilled corn and zucchini which was delicious. Tonight I was feeling lazy and hit Whole Foods for dinner for a huge kale salad. Yeah, that’s my splurge meal when I have the house to myself. Is that awesome or pathetic? 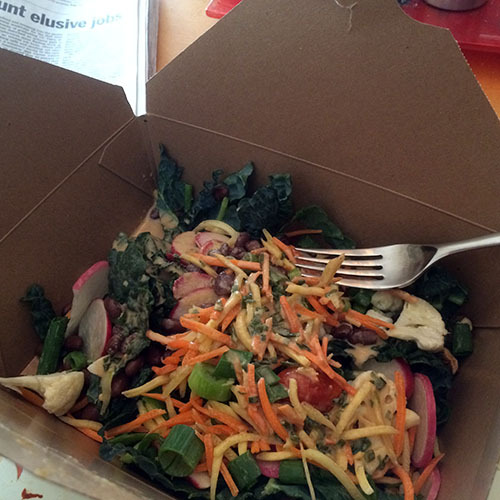 Salad really is my comfort food, especially when I’m in a funk. Eating poorly seems to just make things worse for me. Anyway, I well get to the grocery store this week and get back at it! Continued thoughts for kitty! All of the food looks and sounds amazing! I remember getting that nacho cheez once – not bad at all!